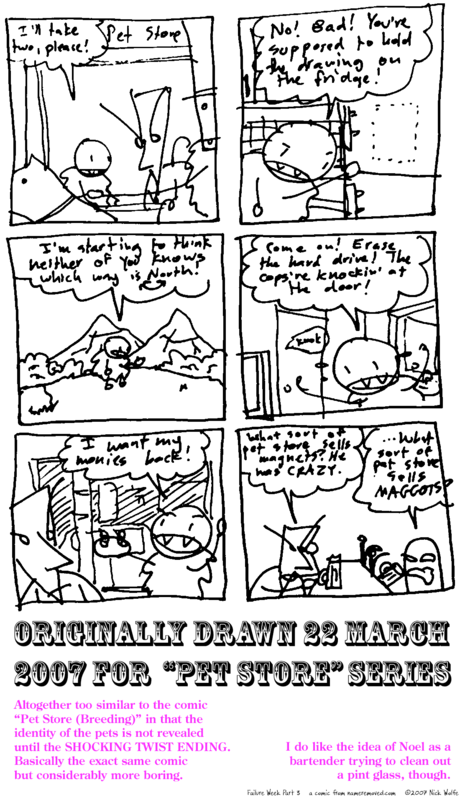 Failure week is capped with a lack of two hilarious failed comics: only one, instead. FAILURE EVERYWHERE! Rabid: I'll take two, please! Rabid: No! Bad! You're supposed to hold the drawing on the fridge! Rabid: I'm starting to think neither of you knows which way North is! Rabid: Come on! Erase the hard drive! The cops're knockin' at the door! Rabid: I want my monies back! Dr Quickly: What sort of pet store sells magnets? He was CRAZY. Noel: ... What sort of pet store sells MAGGOTS? Commentary: Altogether too similar to the comic "Pet Store (Breeding)" in that the identity of the pets is not revealed until the SHOCKING TWIST ENDING. Basically the exact same comic but considerably more boring. I do like the idea of Noel as a bartender trying to clean out a pint glass, though.